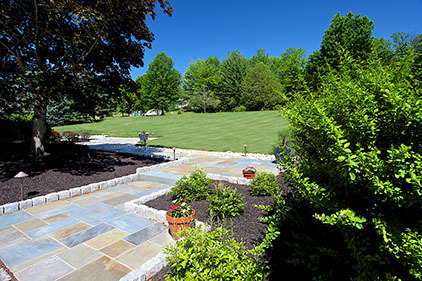 This beautiful Hopewell, NJ property was brought to life with a vast paver patio contained with a sitting wall for starters. There is a an added fire pit, and built in cooking station. 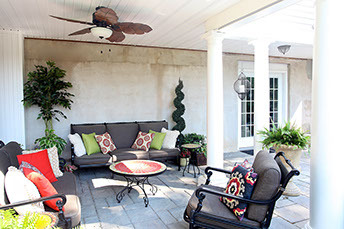 The patio extends all the way under a covered structure which houses outdoor living room furniture. This truly is outdoor living at its finest. There is a meandering stepped stone path through lush plantings in mulched beds that leads to the patio. 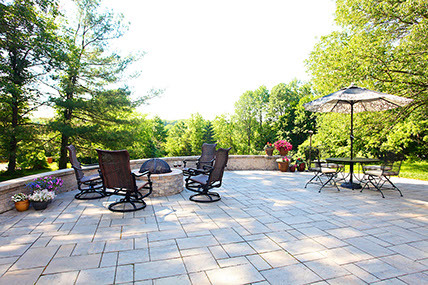 The patio is also accessed through the rear of the house. 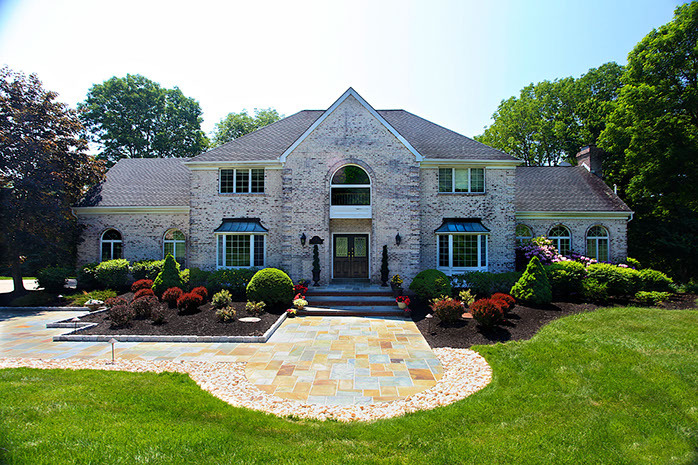 The front entrance and walk way was built from stunningly colorful bluestone surrounded by mulched beddings of equally colorful plantings which is edged with Belgium blocks. Bring the kitchen outside. This custom built in grilling station features a top of the line DCS grill. 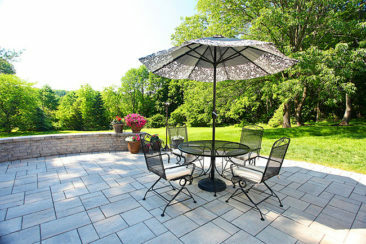 There is plenty of counter top space built around the grill which is made of a colorful rose granite. The walls are Techo-Block 3" Mini Creta. There are storage draws under the grill. A grilling station like this will make you the envy of your neighbors and friends. Last but not least this station has CAST wall lighting built under the granite top to illuminate your cooking light at night. This cozy fire pit is built right into the patio. There is nothing quite like sitting around a fire at night. There is just something about the element of fire that sparks the imagination and story telling with friends and family. Have some fun and cook some marshmallows or a hot dog with the kids. A fire pit is a great place to melt the stress away. 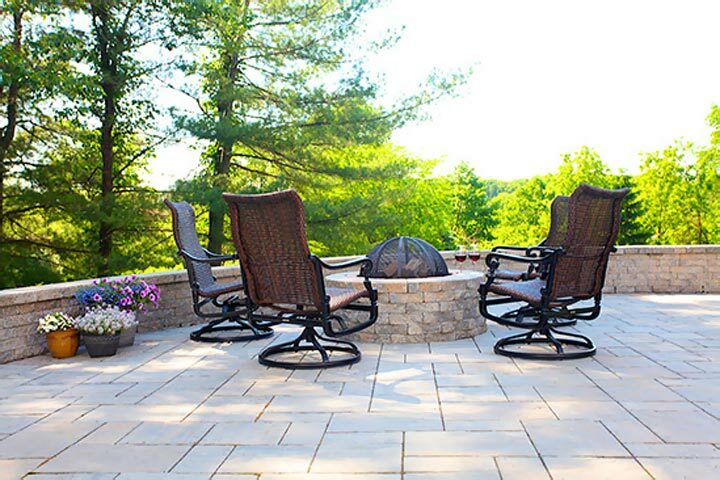 This fire pit has chairs to sit around it. However, there is a sitting wall strategically built around the fire pit which can seat a lot more people near the fire. 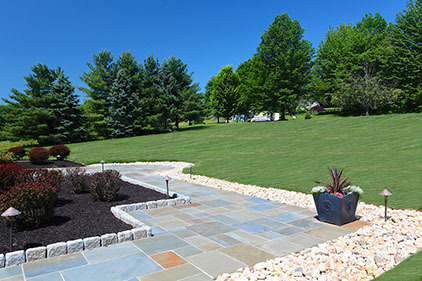 This meandering path gracefully leads one through some larger trees and beautifully designed landscaping. 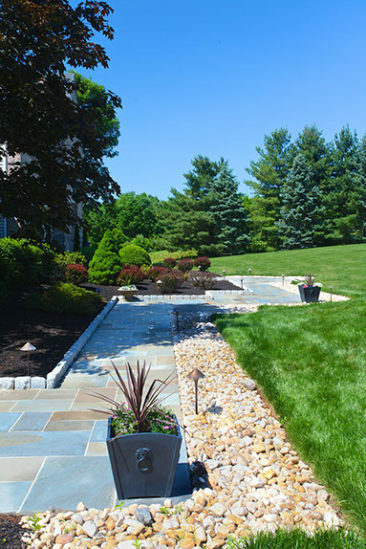 The mixture of bushes, flowers, boulders, and mulch just make this hike from the patio to the front of the house a very pleasing one. The path way has lights too so one can see their way through in the dark. The grade of the land is very slight and there is long horizontal runs with short rises to make walking up or down this path very easy. 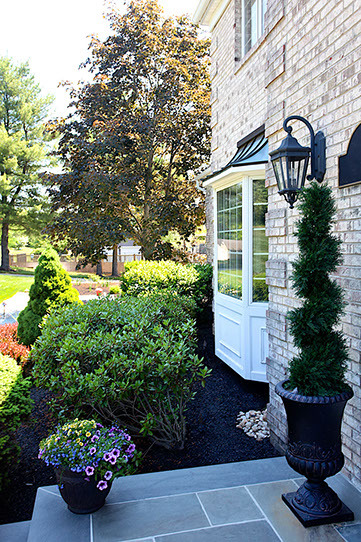 Bluestone front entrances are classy and beautiful. 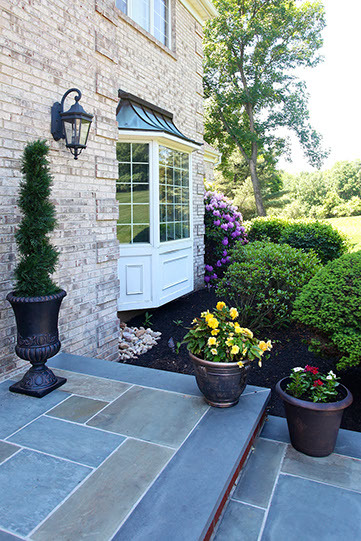 This bluestone front entrance and porch looks amazing and really brings out the grandness of this house. 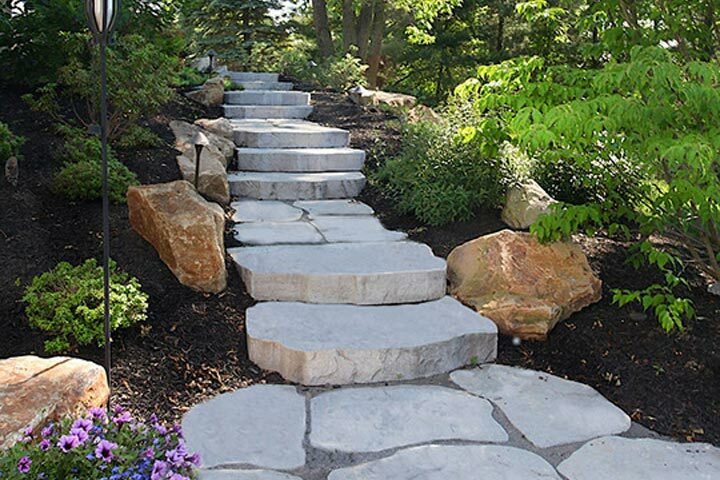 To add some custom design elements to the bluestone, one side is edged with river stones and the other is edged with Belgium blocks. The Belgium blocks help keep the mulch from being blown or washed up onto the walkway, so this is an example of form and function. Cast LED lighting path lighting illuminates this at night. 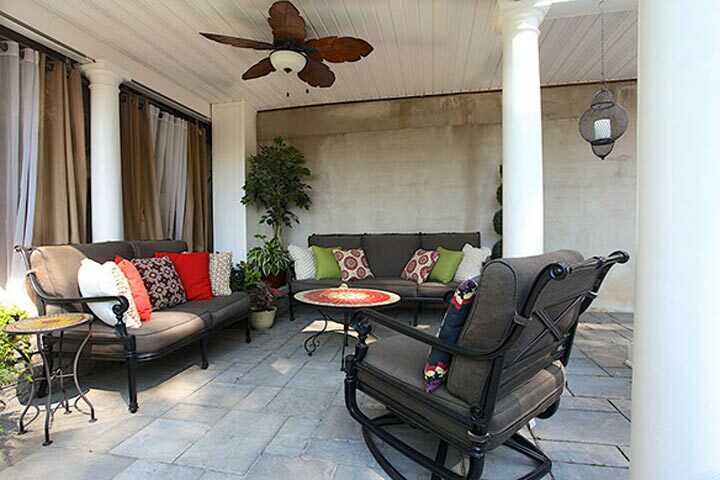 The patio was kept half open to freely walk out in the yard. The other half has a low sitting wall to enclose the space and provide extra sitting. There was nothing else designed in order to preserve the view of the rolling hills in the distance. 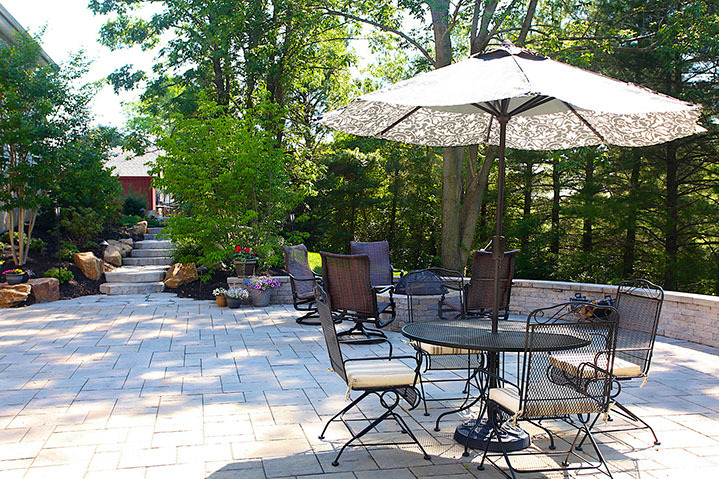 The patio was constructed with Techo-Bloc Blu 60 pavers. The sitting wall has CAST lighting beneath its capped top to create a nice ambiance at night.